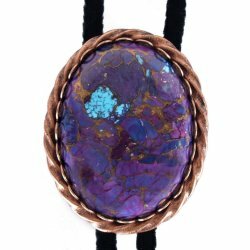 The Mojave Purple Turquoise Twisted Edge Bolo Tie features a large Mojave Purple Turquoise stone with a bronze matrix. 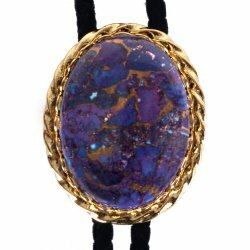 The cabochon measures 40x30mm (or 1 5/8" by 1 1/4". This unique Mohave turquoise is crafted through a process that uses a hydraulic press to assemble turquoise nuggets together along with introducing the bronze metal matrix throughout the brick of turquoise. Once the turquoise is pressed or assembled, it is stabilized to harden the stone. 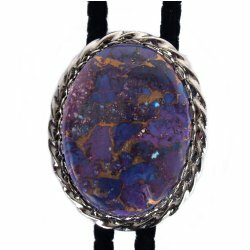 Currently, this is the only product on the market that features real Arizona turquoise and real metal matrix. The stone sits in a oval slide with an attractive twisted edge. It measures 1 3/4" long by 1 1/2" wide and comes in your choice of gold, silver or copper. Add your choice of cord and tips to complete your tie.